B2B SEO Services Are More Important Than Ever. But SEO is certainly past its prime, right? It's little more than a relic of the late 1990s and early 2000s, right? Wrong, wrong and definitely wrong. The fact of the matter is that B2B SEO services are actually more important than ever, particularly when it comes to the types of deep, meaningful and organic relationships that you're working hard every day to establish with your own audience. In fact, there are a number of key reasons in particular why the reports of the death of B2B SEO have been greatly exaggerated. The most important thing to understand about all of this is that SEO in general is still just as powerful as it has ever been. According to one recent study, a massive 93% of ALL online experiences still begin with a search engine like Google. 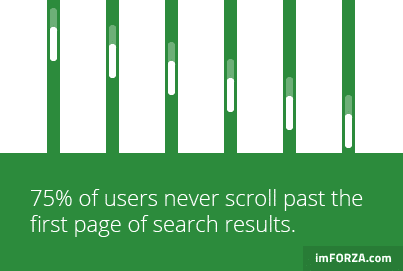 When a customer conducts a search for a particular term, 75% of them will never actually scroll beyond the first page of results. If you think that your sleek, sophisticated B2B social channels will help pick up some of the slack... you're wrong about that, too. 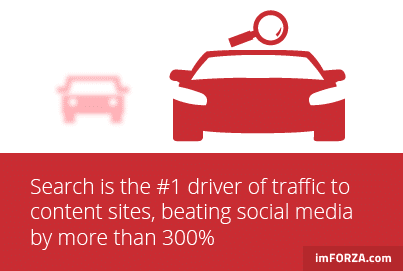 Another study estimates that search is actually the biggest driver of traffic to content sites in existence, beating social media alone by more than 300% in most cases. So SEO itself is still powerful... but is it still relevant to the world of business-to-business marketing? The answer to that question is also a simple one: absolutely, yes, beyond the shadow of a doubt. According to a recent survey, a full 57% of all B2B marketers who responded said that SEO still generates more leads than any other marketing initiative that they participate in. But if you think you can just buy your way to the top of those search results through paid advertising, you might want to think again. Another study estimates that 70 to 80% of users tend to ignore the paid ads entirely, choosing to instead focus solely on the organic search results. In fact, organic B2B SEO leads tend to have an average close rate of about 14.6% - compared to the just 1.7% close rate that most outbound marketing leads will bring with them. According to yet another recent study, 61% of B2B buyers say that they look to third party review sites before approaching a business. Making an effort to focus on your B2B SEO is another way to help generate these reviews, which in turn will help generate better, more qualified leads as well. Along those lines, it was revealed that every additional review tends to add about 20 new monthly visitors to a company's profile. Any one of these statistics on their own present a compelling argument for the fact that B2B SEO services are alive and well. When you consider the much bigger, more important picture that they're all painting collectively, you realize that B2B SEO is still one of the most powerful tools you have in terms of expanding your audience and increasing your revenue - something that is likely to remain true for the foreseeable future. B2B SEO also plays directly into another one of your most important marketing efforts - content. It's no secret that content marketing is incredibly effective in the B2B space, often leading to as much as a 2,000% increase in blog traffic and a 40% increase in revenue at the same time. But how, exactly, do you think that your B2B buyers are actually finding the high quality, valuable and informative content that you're creating? That's right - they're doing so through their search engine of choice (and, incidentally, probably on a mobile device). Techniques like social media can help drive traffic, yes - but without the right B2B SEO strategy at the heart of it all, you'll essentially be flying blind in a digital world that is moving faster than ever. But again - none of this is to say that you should suddenly abandon everything else that you're doing in favor of B2B SEO. Far from it - that would be just as foolish as abandoning B2B SEO in the first place. But what you really need is the insight to recognize what an important part of your entire campaign B2B SEO actually is. It's the foundation of your collective efforts - the rock solid foundation from which everything else will be built. It can not only feed directly into everything else that you're doing and create a ripple effect in the best possible way, but it's also the perfect opportunity to bring all of these elements together to form the cohesive whole that you need when you need it the most. With ongoing SEO support, it means we're always finding new keywords and topics to generate potential customers to the Roka Security website. With over two decades of experience under our belts, we at Sherpa53 consider ourselves to be more than just another B2B digital marketing agency. We're a true partner in your organization's success in every sense of the term. We pride ourselves on our ability to operate as a true lifecycle marketing agency. This means that our solutions are geared towards maximizing every last step of the ENTIRE marketing process, from awareness to conversion and absolutely everything in between. If you'd like to find out more information about why B2B SEO services are more important than ever, or if you just have any additional questions that you'd like to see answered, please don't delay - contact us at Sherpa53 today.